It may be wet but thankfully our temps don’t have a minus sign in front of them. Share some fun times and great food with your friends and family at First Friday on Abbot Kinney. And drink a toast to the many things we’re grateful for here in SoCal. on the Blvd this month. Many trucks have been with us for years and join us almost every month, including Sanook Soi 38, Grilled Cheese, Rollin’ Lobster, and Vchos. We’re shoutin’ out to the old-timers! Sanook Soi 38 serves fresh and authentic Thai food to raving fans. Sanook means fun in Thai and the name is meant to express the pleasure the owners had eating street food at a favorite spot on Sukhumvit Road in Bangkok. Soi 38, or street 38, is a place of myriad culinary pleasures, where any Thai food your heart desires is yours for the asking. Vchos serves up traditional Salvadoran flavors with a modern twist, bringing the food into the mainstream for the Vchos (young people) of Los Angeles. Rollin Lobster Gourmet Food Truck offers a wonderful sampling of East Coast goodies, featuring only fresh Maine Lobster (never frozen) in Lobster Rolls, Lobster Sliders, and Lobster Louie along with clam chowder and lobster bisque. The Grilled Cheese Truck - the name says it all. But it’s not just the classic bread, butter and cheese kind of Grilled Cheese - they tweak everyone’s favorite comfort food and serve amazing creations made with the best ingredients and local produce, from a basic grilled cheese with tomato or ham to the extravagant with marshmallows or macaroni. 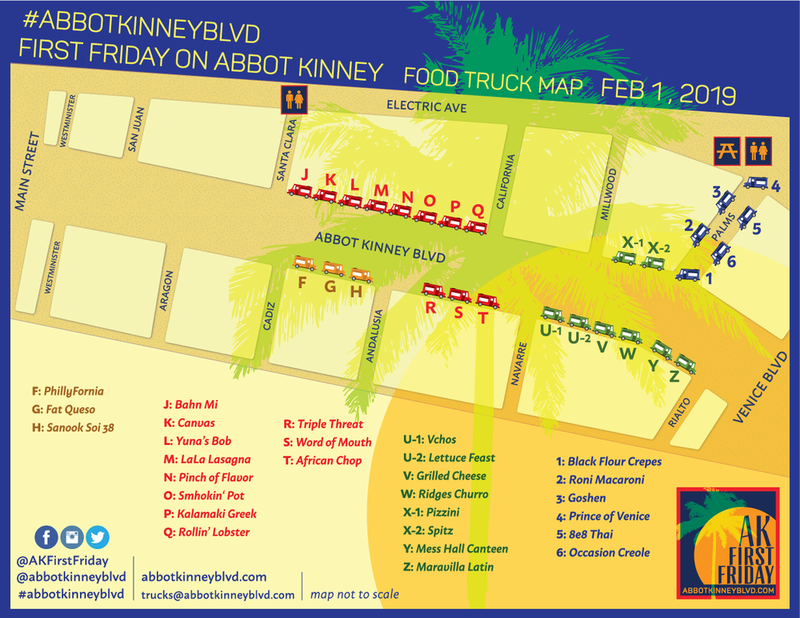 It’s perfect weather to indulge in rich comfort foods this week - and you’re sure to find your favorite at the February Abbot Kinney First Friday. Enjoy! We’ll see you on the Blvd.